28/01/2011 · Dallas, TX · The Form of the Book, by Jan Tschichold, is the authority on book design and the best book I have ever read on typography (and I’ve read many, mind you). As a web designer this book taught me how to set readable, easy-to-digest blocks of type. As the lead designer on Unit Interactive’s recently launched Curations series, I found new relevance in these pages. The principles of setting type to be read and laying out a harmonious page transcend medium and materials. A solid understanding of the fundamentals detailed in this book will make any designer better. Instantly. The English edition was expertly translated by the author of my second favorite book on typography, Robert Bringhurst, but is sadly out of print as of this writing. A decent copy will run you $80 – 150 on Amazon. Please stay tuned to the end of this post to see how we can change that. In this digest, I have taken the time to excerpt the most enlightening bits. I chose these passages because they struck me with some new insight or solidified some already known rule with sound reasoning. 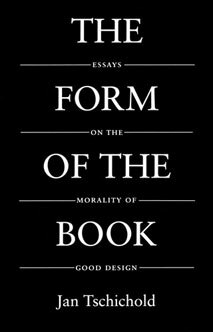 The sub-title, “Essays on the Morality of Good Design”, gives you a good understanding of just how serious Mr. Tschichold takes these matters. Highly influenced by the Bauhaus of the Weimar Republic, Tschichold made his first bold statement with Die Neue Typography in 1921, decrying the staid, serifed, uninteresting layouts of symmetry and building a framework for balanced yet asymmetrical typographical compositions. The Form of the Book is actually a collection of essays written from 1949 through 1974 by Jan Tschichold and was originally compiled in 1975. Robert Bringhurst translated it to English from the German text in 1991, and he also wrote an enlightening introduction for that edition. Not everything in the book (or these excerpts) is immediately relevant, but the basic principles can still be applied. I have made sure to leave in some artifacts so you can get a feeling for the text, warts and all. “A precondition for satisfactory finished work and for pleasant readability is the correct typesetting of each single line. Most typesetting in most countries is too loose. This defect is inherited from the nineteenth century, whose light, thin and pointed scripts almost demanded word spacing with en quads. Our own somewhat bolder scripts lose their line bond if this wide spacing is adopted. Three-to-em or even more compressed word spacing should be made the rule, unconditionally, and not in books alone. Unless the work consists of unusually long sentences, it is also unnecessary to increase the space after a period. Ideal margin proportions 2 : 3 : 4 : 6. There is plenty more knowledge in the book, but I have neither the time nor permission to post it all here. Instead, I ask that if you care about typography, or you recognize the growing need to for this kind of knowledge in the ranks of digital publishers, please do as I have done and contact the good people of Hartley & Marks to let them know that this book needs to be put back in to print. It is ever relevant and necessary, and there is a growing market. This is the best contact info I have for them (from their site), and I will post others means if I get them. Thanks! Contact info for Canadian, European, and Asian offices available on their site.